The excellent 18-hole, par 72 golf course was designed by Dave Thomas, one of the most prestigious European golf designers. It was created by combining different environments and working for a total adaptation to the Mediterranean landscape and vegetation. Golfers will find Roda Golf & Beach Resort the perfect spot to put their skills into practice, it has all the convenience of being able to enjoy this magnificent sport any time you wish, with an entire golf course just a few steps from your home! Use this link to: Download a very large version of the golf course plan! The overall result is a course we are sure you will enjoy and it is our intention to further develop all aspects of Roda Golf and Beach Resort to create one of the best all round facilities in Spain. The golf operation is managed by De Vere Hotels & Resorts who have many years of expertise of managing all aspects of golf at every level - from a friendly four ball to amateur competitions & corporate events, through to major European Tour events including the Ryder Cup Matches which have been held at a De Vere Hotel - The De Vere Belfry for a world record 4 times. The De Vere Group will manage all aspects of the De Vere Hotel at Roda as the facilities continue to come on stream over the next few years. 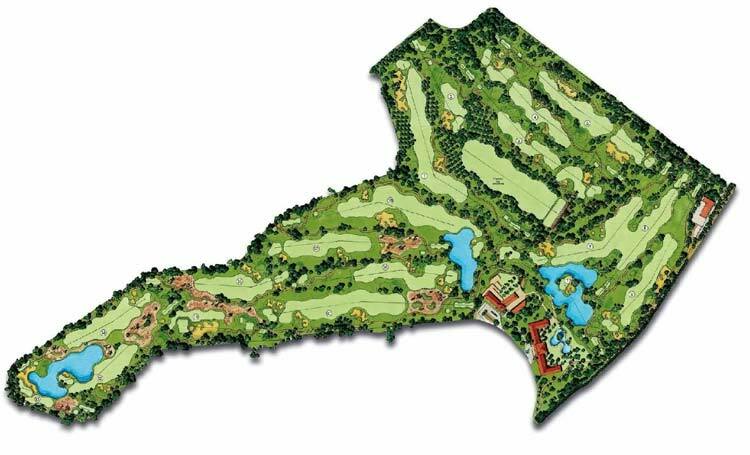 Roda Golf Course - The "hole by hole" guide! Note - We are going to add hole by hole photographs to this section! Stay tuned! An opening drive designed to encourage positive attitude from the start. The bunker on the corner can be carried depending upon individual ability or played safely to the left. The elevated green is defined by the large bunker to the left hand side which extends down the fairway, making choice for the second shot important in the strategy of the hole. A good result will be encouraged by positive play. This is a long and exacting par 3 early on in the round. A large bunker covers most of the right hand side of the green and again an elevated green means it is important for a well struck iron shot. Flag placements to the left of the green will look generous, although flags can be placed to the right side and look daunting next to the bunker. The first of two demanding back to back par 4’s. An exacting drive is required between two bunkers on an elevated landing area. A medium to long iron approach shot to the raised platform green will be difficult for the amateur player particularly as the green is guarded by a very deep bunker to the left. While a good player will be drawn to attacking the hole, the handicap player requires strategy. An accurate tee shot from the elevated tee is necessary. Again, the landing area is protected with two bunkers which must be negotiated accurately. The second shot, again with a medium to long iron, must negotiate large bunkers in front of the green on the right hand side. Flag positions can be hidden behind difficult roles on the green, making this the hardest hole on the first nine holes. A relatively short par 5 and a good birdie opportunity. A good drive must negotiate safely the big bunker on the left hand side. This will open up the green and encourage an attacking second or third shot for birdie opportunities. A straight hole with everything there to see. It is important to hit the fairway as the green is surrounded by deep bunkers to the front and sides and role off valley to the back of the green. Although only a short par 4 it will have interesting challenges depending on the flag position. An island green designed to intimidate and entice the golfer. A medium to short iron par 3 where accuracy is everything. The chance to put this in front of the clubhouse and hotel for the amusement and entertainment of those watching was too good an opportunity to miss. A relatively easy par 4 with little trouble from the tee. However, all the problems are with the undulating green and the deep pot bunkers waiting to catch missed approach shots. A classic golf hole design to complete the first 9 holes. The green can be seen from the distance, placed between mounds, bunkers and deep rough zone however the player must ignore the flag and play out to the left where the only trouble are two pot bunkers on the right hand side. The undulating green will provide interesting flag positions and difficult puts and the lake which sneaks into the left hand side of the green should not be ignored as a potential hazard. The second nine holes is less aggressively mounded, although the same philosophy of play is relevant; aggressive and positive play will provide rewards. The open tee shot to this hole is generous with only a big bunker to the left being the golfers problem. However, the second and third shot become increasingly difficult with the several bunkers designed to catch inaccurate shots. A good opening hole to the back nine with birdies a real possibility. A medium iron par 3 to an elevated green played all across large bunker. The platform green is designed to help hold the tee shot, but any slight miss should role away to the back and right hand side. A good par 3. A short par 4 with the green placed out into the lake. Aggressive play may give as many birdies as disasters. Strategy may be the best approach for this hole. A straight forward par 3 in which accuracy and club selection is important for success. Not a very long par 3 which should encourage attacking play although care must be taken when the flag is placed near the water’s edge. A relatively straight forward par 4. A good drive to a generous fairway will leave the shortest of approach shots to the elevated green. Another short par 4 which can be played strategically with an iron off the tee to a generous fairway or with more aggression to the green carrying the fairway bunkers. Again the elevated green may make it tricky but certainly birdies are a real opportunity. A relatively straight forward par 4 in which two good shots will give a good result. The tee shot has only two bunkers in the fairways to negotiate and the large undulating green guarded by a bunker on the left hand side. A super par 5 to finish the golf course with. The tee shot must be played between two bunkers to a narrow landing area, although favouring the left hand side will give the best line to the green which is positioned across the lake. Hitting the green in two shots is definitely a possibility but accuracy is extremely important. A great matchplay hole to finish in which strategy becomes an important part of the way you play. The professional and amateur golfer can now enjoy the most advanced technology to develop and improve their game at the golf academy at Roda Golf Course, with the approval and the direct supervision of the Professional Golf Association (PGA), the most prestigious in the world. The facilities provide golfers of all levels, the latest generation of specialist equipment, necessary to improve his or her game. This is the most advanced technology including: the GASP (analysis of the movements through video recording), biomechanics system SAM, Puttlab, the K-Vest, 3D modelling, a force platform to assess balance and weight transfer and the TrackMan launch system to measure, ball carry, flight and spin rate. Ideal for accurate club fitting and choosing the right kind of ball. At the academy, there are two areas of instruction designed by experienced professionals in order to offer the general public the latest learning techniques. In addition, there are ten other individual practice areas that will offer players a spacious and private atmosphere in order to practice. It is worth noting there is a total area of 970 meters set aside for practice, including putting green and pitching area that offers players a chance to improve the short game. The Academy of Roda Golf Course will open it's facilities throughout the year for all types of golfers, from the novice to the most advanced professional. It will offer several training programs, in order to satisfy each and every one of the golfers, taking into account their needs and demands for personal improvement. The team of teachers at the academy comprises of experienced professionals from the world of golf. The academy's main training covers not only the physical aspect but also include psychological and technical training. These aspects require individual schedules for each player, with the aim of maximizing their performance over the duration of the course. Enrolment at the academy can be individual or in a group and a schedule is given to each player based on their current level. This ensures that the player's level can be tracked in the future as the training progresses. This improvement plan or schedule, is extremely professional and customized to all players as the Professional Golf Association (PGA) of Europe has overseen both the construction of the facility itself and the teaching level of all the teachers for the new PGA academy at Roda Golf. Nicky Lawrenson has a Certificate AA PGA. Nicky started to play golf more than 20 years ago, initially as a hobby which eventually became her way of life. Her professional career began at the home of the PGA, The Belfry, where she played host to many tournaments, not least The Ryder Cup. She later moved to the United Arab Emirates in order to supplement her training and work experience, working in "Emirates Golf Club." In Dubai she gained experience from coach Peter Cowen and she finally gained her license as a Senior Academy Instructor. During this stage she acquired a lot of experience working with Peter Cowen, coach to many professional players on the tour, such as Henrik Stenson and Ian Woosnam. Because of her continued desire for progress in the world of golf, Nicky attended seminars and studied the principles of renowned coaches such as Butch Harmon, David Leadbetter and of course Peter Cowen himself. Her passion for golf has also taken her to the golf courses in Melbourne (Australia), where she worked with the greatest experts in the field of physiotherapy and health applied to golfers. Nicky has trained golfers of all ages and abilities throughout her career. Her ideals are based on a holistic approach to learning, coupled with a great passion, motivated primarily by the development of each of her players. Training with her improvement staff is always fun and easy.